Research in Motion may launch a 7-inch tablet device as early as Monday that has no 3G connectivity and an entirely new operating system, according to reports. Rumblings about a BlackBerry tablet have been circulating for months, but very few device details have leaked. The information that has leaked has remained surprisingly consistent such as the lack of 3G connectivity and a new OS for the device. The screen size has been up for debate, with some saying the device will have a 7-inch display while others saying 9.7 inches. Whatever the screen size, the tablet - also known as the BlackPad - may be announced during RIM's Blackberry Developer Conference that starts Monday in San Francisco, according to the Wall Street Journal . As we get ready for a rumored BlackPad launch here are 5 things I'm wondering about the new device. The so-called BlackPad reportedly won't have a built-in 3G antenna. Instead, you'll have to tether your BlackBerry handset to the tablet for cellular data service. The Journal also says the BlackPad will include Bluetooth connectivity and a "broadband connection," which probably means the tablet will have Wi-Fi. While adding tethering capability is a nice idea, it seems strange not to include a 3G option for the rumored BlackPad. Apple's iPad has Wi-Fi only and 3G + Wi-Fi options. The forthcoming Samsung Galaxy Tab will launch as a 3G + Wi-Fi device, with a Wi-Fi only version to follow shortly thereafter. The hassle of having to tether your tablet to your handset may make the rumored BlackPad a nonstarter for many users. Not running Blackberry 6, OS, really? A persistent rumor circulating since at least August is that the BlackPad wouldn't be running Blackberry 6. Instead, the device would run a tablet-specific OS based on QNX software. QNX, acquired by RIM in April, makes embedded operating systems for a variety of products such as cars, medical equipment and unmanned aircraft control systems. It's not clear why RIM would give up on Blackberry 6 after launching the new OS with much hoopla in New York this summer. JavaWorld speculated in August that RIM may have wanted a fresh start with the BlackPad since the BlackBerry OS may contain a lot of legacy code making it less adaptable and stable. 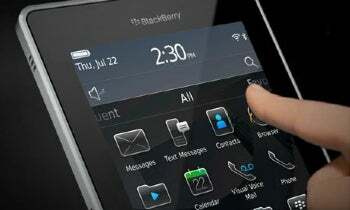 The Journal says RIM will eventually be moving its BlackBerry handsets to QNX software as well. What will the OS do? Since this is a RIM device, you have to wonder if the BlackPad will be primarily focused on enterprise customers. RIM's main business is all about supporting government and corporate customers that depend on BlackBerrys for secure e-mail and wireless communication. That being said, RIM has been adding more functionality to attract individual users. The touch-based interface for BlackBerry 6 devices is a huge improvement over RIM's bizarre SurePress technology. BlackBerry 6 also has an improved Web browser based on the WebKit browser engine and an overhauled multimedia player for your music. But with RIM's focus on business, how many regular consumer options would the BlackPad include? What would the multimedia capabilities be like for video and music playback, and what about purchasing content for your device? The Journal says RIM is working with Amazon to produce a music application for BlackBerry. Would that show up on the BlackPad? What about improvements to the gaming selection at App World, the third-party applications store for BlackBerry devices. The Journal says the BlackPad will come with either one or two cameras. Presumably, this means the device will most likely have a rear-facing camera but it's not clear whether it would also get a front-facing camera for video chat. If it had launched a year ago RIM may have been able to get away with not putting a front-facing camera on the rumored BlackPad. But front-facing cameras are quickly becoming standard parts of new mobile devices. The Samsung Galaxy Tab has two cameras, and there are rumors the iPad 2 will add a front-facing camera. Many new mobile handsets are now sporting front-facing cameras such as the iPhone 4, new iPod Touch, Sprint EVO 4G and the Dell Streak. Hopefully, the BlackPad will include video chat capabilities as well. How will you buy the thing and for how much? If there's no 3G connection, and presumably cellular contract, will you be able to buy the BlackPad independent of the cellular carriers? Since it's a BlackBerry companion device, it would make a lot of sense to buy it through AT&T, Sprint, T-Mobile or Verizon. But will you be able to buy the BlackPad as a standalone device right next to the iPad at Best Buy? If carriers are selling the device exclusively, will the BlackPad come with any restrictions? For example, will you have to pay extra to tether the rumored BlackPad with your BlackBerry device, as you do to tether the iPhone on AT&T? Finally, how much will this device cost? Since the BlackPad reportedly comes without a 3G antenna, you would think it would be priced nearer to the Wi-Fi only iPad's $499 price tag. As opposed to the Galaxy Tab's unlocked price that is estimated to be $700 or more. Of course, pricing also depends on how much onboard storage the device will have, whether it would support external memory cards and any other hardware options the device may include. The rumored BlackPad could be an appealing device, but we'll have to wait until early next week to see what RIM has planned.